An Ariane 5 rocket launches the unmanned ATV-3 Edoardo Amaldi robotic cargo ship toward the International Space Station on March 23, 2012 in a successful liftoff from Guiana Space Center in Kourou, French Guiana. This story was updated at 9:06 a.m. ET. A huge robot European cargo ship launched to the International Space Station today (March 23), lighting up the night sky over the northeast coast of South America to begin a five-day journey to deliver key supplies to the orbiting outpost. 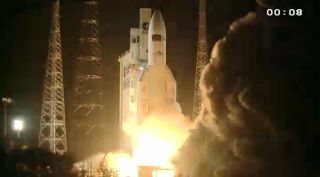 The European Space Agency's third Automated Transfer Vehicle (ATV-3) lifted off at 12:34 a.m. EDT (0434 GMT) atop an Ariane 5 rocket from Europe's spaceport in Kourou, French Guiana. After a brief light show, the rocket slipped through a cloud layer and soared into orbit. The vehicle is scheduled to arrive at the space station on March 28 at 6:32 p.m. EDT (2232 GMT). An Ariane 5 rocket carrying the European Space Agency's ATV-3 cargo ship Edoardo Amaldi lights up the night after a dazzling liftoff just after 12 a.m. EDT from Guiana Space Center in Kourou, French Guiana. The ATV-3 is nicknamed "Edoardo Amaldi" after the famed Italian physicist and spaceflight pioneer who is credited with helping to create the European Space Agency. Amaldi is also one of the founding fathers of CERN, the particle physics laboratory along the Swiss-French border that houses the Large Hadron Collider. The cylindrical spacecraft is 35 feet (10.7 meters) long and 14.7 feet (4.5 meters) wide - large enough to fit a double-decker bus inside. Europe's disposable ATVs are designed to automatically dock to the Zvezda module on the Russian portion of the International Space Station. The cargo ships then remain attached to the complex for up to six months before they are packed with garbage and deliberately sent to burn up during atmospheric re-entry. The European ATVs are part of an international fleet of disposable robot cargo ships that are used to transport hardware and critical supplies to the space station. Russia's unmanned Progress ships and Japan's H-2 Transfer Vehicles (HTVs) also regularly ferry cargo to the orbiting outpost. This view from an Ariane 5 rocket camera shows the rocket's boosters (one at far right) falling away after being jettisoned during a successful launch of the European ATV-3 cargo ship toward the International Space Station on March 23, 2012. The ATV spacecraft are not the only vehicles launched into orbit by Arianespace out of the European spaceport in French Guiana. Earlier this year, ESA's first Vega rocket, which is smaller than the Ariane 5 and is built to loft small satellites, blasted off from the space center. Last year, Arianespace also began launching Russian-built Soyuz rockets on unmanned missions from the South American site. "We are now a significant space power," Dordain said. "I can say that."